ArcMap 10.6 introduces new features and capabilities, which are described in the following sections. 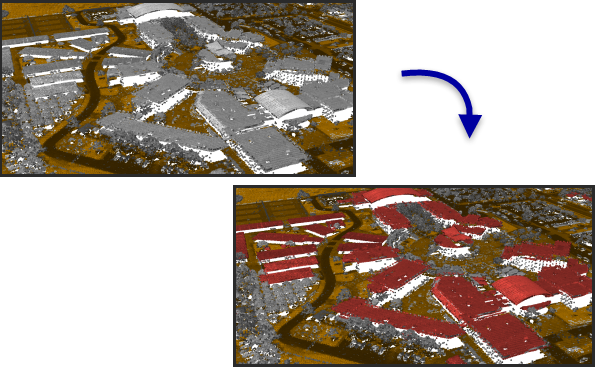 The Classify LAS Noise tool classifies noise points in LIDAR data. The Raster to Polygon tool in the From Raster toolset has two new parameters. The Create multipart features parameter specifies whether the output polygons will consist of single-part or multipart features. The Maximum vertices per polygon feature parameter allows you to specify a limit for when polygons are subdivided. A new tool is available in the Raster toolset: Generate Raster Collection. This geoprocessing tool performs batch processing on image collections in a mosaic dataset. The Create Raster Type geoprocessing tool is no longer supported. Three new tools are added to the Network Dataset toolset. The Make Network Dataset Layer tool allows you to create a network dataset layer from another network dataset that is referenced using its catalog path. The Create Template From Network Dataset tool creates a file containing the schema of an existing network dataset. The Create Network Dataset From Template tool creates a new network dataset using the schema from a template file. A new tool, Cost Path as Polyline, is available. This tool is similar to the Cost Path tool, but outputs the path as a polyline feature class instead of as a raster. The following tools now support parallel processing for enhanced performance: Cost Allocation, Cost Distance, Euclidean Allocation, and Euclidean Distance. The Nibble tool has two new parameters to give you more control over the nibbling process. With Nibble NoData cells, you can now specify whether or not NoData cells in the input raster that are within the mask can be nibbled to a value, or remain as NoData. The Input zone raster parameter allows you to specify zones to control where nibbling occurs. The Nibble tool now supports parallel processing for enhanced performance. A new tool—Flow Distance—is available for calculating the minimum downslope distance for each cell to the stream into which they flow. The Flow Accumulation tool now supports a new output data type of Double, to provide more accurate accumulation values. The Flow Direction tool now supports two new algorithms for determining the direction of flow. A new parameter, Flow direction type, allows you to choose between the original algorithm (D8), multiple flow direction (MFD), and D-Infinity (DINF). The following tools now support parallel processing for enhanced performance: Fill, Flow Accumulation, Flow Direction, Sink, Stream Link, and Watershed. The Rescale by Function tool now supports parallel processing for enhanced performance. Two new machine learning classification tools are available, Deep Learning Model To Ecd and Export Training Data For Deep Learning. The deep learning classifier employs deep neural networks, which exploits the methodology of hierarchical explanatory factors. More complex features in higher levels are learned from simpler features at lower levels, based on training sample data. For feature classes in a database, choose the PG_GEOGRAPHY configuration keyword. For feature classes in a geodatabase in PostgreSQL, choose a configuration keyword that has the GEOMETRY_STORAGEparameter set to PG_GEOGRAPHY. This may be the DEFAULTS keyword, the PG_GEOGRAPHY keyword, or a custom keyword defined by the geodatabase administrator. Check with your geodatabase administrator to confirm which keyword to use. See PostgreSQL database requirements for ArcGIS for PostgreSQL and PostGIS versions required to use the geography spatial type with ArcGIS. ST_GeomFromCollection—Allows you to return each individual geometry within a multipart geometry when querying from a SQL client. ST_DWithin—Allows you to find features within a specified distance of other features when querying from a SQL client. These functions are available when you create a 10.6 geodatabase in PostgreSQL, upgrade your geodatabase in PostgreSQL to 10.6, or update the ST_Geometry type in your PostgreSQL database with the 10.6 ST_Geometry library. ArcGIS now supports connecting to Microsoft SQL Server databases on Linux. You can also create geodatabases in SQL Server on Linux. In addition, you can connect from ArcGIS Server on Linux to SQL Server on Windows or Linux. See Microsoft SQL Server database requirements for ArcGIS 10.6 for supported database and ODBC client versions. Two new raster types are added to support Sentinel-1 (radar) and WorldView-4 sensor data. Two raster functions are added to correct Sentinel-1 data, thermal and radiometric calibration. The Geocode Addresses geoprocessing tool now supports the Country parameter, which allows users to limit geocoding to one or more countries for locators that support this feature. There is enhanced Bing layer support for the Roads and Hybrid layers, with more up-to-date data. Use the Rubik Cube solver program to calculate the solution for your unsolved Rubik’s Cube. This entry was posted on March 7, 2018 by Tom Bresnahan.